Mundo has filled a traditionally troubled spot in downtown Winston-Salem, as well as the need for a "foodie" tapas bar in the city. One would think it's the perfect location - right next to the Stevens Center, at the prime corner of Marshall and 4th Streets, but that also makes it a destination spot. I dined here prior to seeing a show at the Stevens Center, so the restaurant was packed. On any given weeknight, I'd be interested to see the numbers. I'm thankful a spot like this has opened in Winston, challenging diners to partake in Lamb Belly and Octopus. Served tapas style, all the dishes I sampled were delightful. You'll want to indulge in one of their Craft Cocktails (all $9.) The Singapore Sling is stronger than you'd think, with pineapple and mango juices and subtle notes of Brandy. The wine and beer list is impressive. The menu is creatively labeled "Mini Smalls," "Veggie Smalls," "Biggie Smalls" and "Skewers." We decided that for 3 people, two Veggie Smalls, two Biggie Smalls and a Skewer would do. We did not leave hungry. We asked that the dishes be staggered, starting with the Camarones Zarandeados and Chili-Lime Grilled Asparagus, a flavorful pairing. The Chili-Lime notes of the Camarones (Shrimp) impart a nice char and saltiness on the Asparagus, dressing up the standard veggie. Cilantro and Pico de Gallo top the shrimp and Asparagus, which rests on a bed of Black Bean Puree. This is smooth and velvety, drizzled with a touch of Mexican Crema and Queso Fresca. 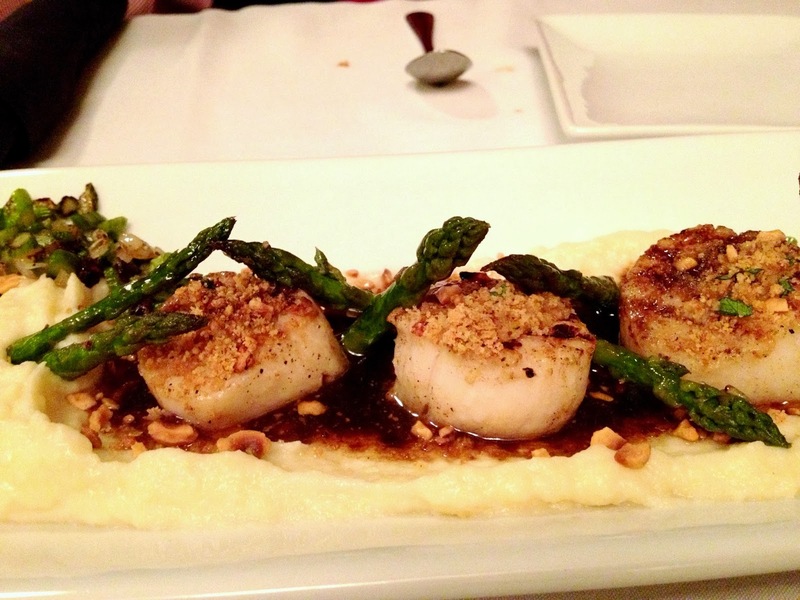 The Scallops Grenolboise (a French sauce featuring Browned Butter - YUM) are cooked perfectly, and the tender little things are served on a bed of lemony Parsnip Puree - a nice change from Mashed Potatoes - with Hazelnuts and Asparagus. This is a wonderful dish, probably large enough for one person. You get three Scallops with this preparation. I detected a slight note of Balsamic Vinegar, which enhanced it even more. If you haven't tried Korean BBQ, make it a point to order it whenever you see it on the menu. 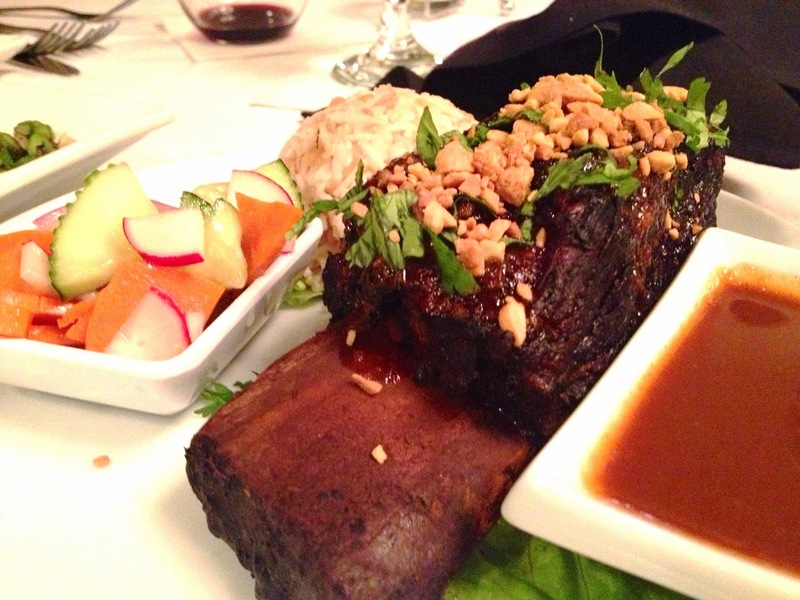 The Short Rib is served on the bone, to make for some UBER-melt in your mouth meat. The Persian Rice, Pickled Vegetables, Peanuts and Kalbi (BBQ) sauce really make this dish. You could even make a little wrap with the tender Butter Lettuce leaves. I am in love with this preparation. 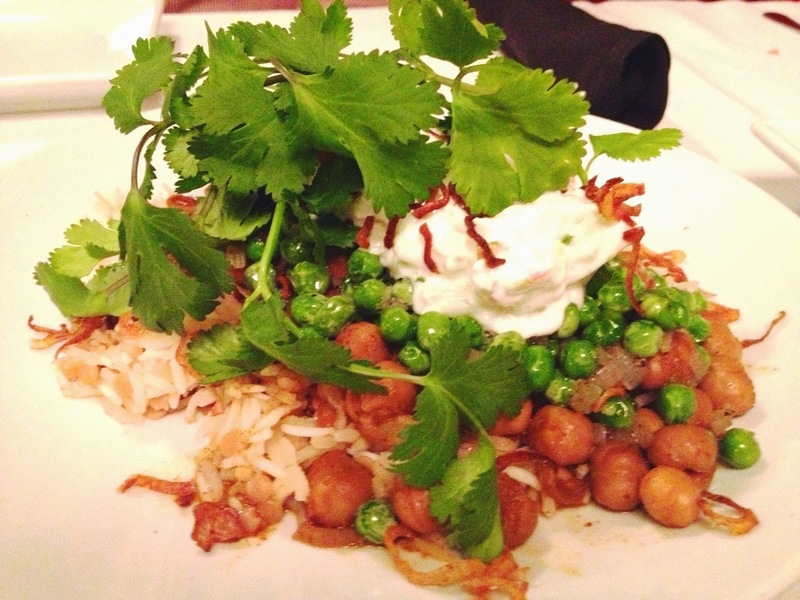 If you're weary of Indian flavors and cuisine, the Chana Masala is very safe. Lightly Curry-Stewed Chickpeas and Green Peas are served with Persian Rice (like toasted Basmati), with Yogurt-dressed Cucumbers. The Curry is just barely noticeable, not offensive in the slightest. This is enough for one vegetarian entree. I look forward to many repeat visits to Mundo, and curious to see others' reception of the spot.